From the mid-1800s through the early 1900s, Sinkyone people were massacred and driven from their land, with some survivors joining neighboring tribes. Established in 1997, the InterTribal Sinkyone Wilderness preserves a small portion of the original Sinkyone Indian territory on 3,845 acres of redwood forestland along the northern California coast in Mendocino County. This land holds great cultural significance for local tribes, which in the mid-1980s helped stop clear-cut logging of coastal old-growth redwood forests and formed the InterTribal Sinkyone Wilderness Council, a nonprofit land conservation organization comprising ten federally recognized tribes with direct ties to the Sinkyone region. 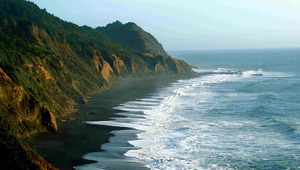 The Trust for Public Land, along with the Pacific Forest Trust, the California Coastal Conservancy, and others, assisted the council in reestablishing Indian control of the land and in executing easements that ensure permanent conservation of its sensitive cultural and ecological resources. We are currently working with the Sinkyone Council to add several thousand more acres of remote ancestral redwood lands to the InterTribal Sinkyone Wilderness.